Jiri Pavlenka is no stranger to being kept on his toes. The Czech international has faced more shots in his debut Bundesliga season that any other stopper in the German top-flight in 2017/18, repelling over 60 per cent of them. If Naldo's the master, Matthias Ginter is the apprentice. The 24-year- has rediscovered his best form for Gladbach this term, and has developed the uncanny knack of popping up from set-pieces with goals. Cologne's Jonas Hector brings that added bit of star quality to the North's no-airs-and-graces back line. The Germany international is essentially a left-footed version of Piszczek, but with the bonus of being able to operate in central midfield and on the left wing. Schalke's Leon Goretzka is another gazelle-like No.8. If he and Naby can figure out who sits back and who bursts forward, they'll be unplayable. If Carlsberg did football academies, they'd probably churn out one Leon Bailey clone after the other. The Leverkusen flier has the pace and trickery of Arjen Robben – except he's nearly 15 years younger! 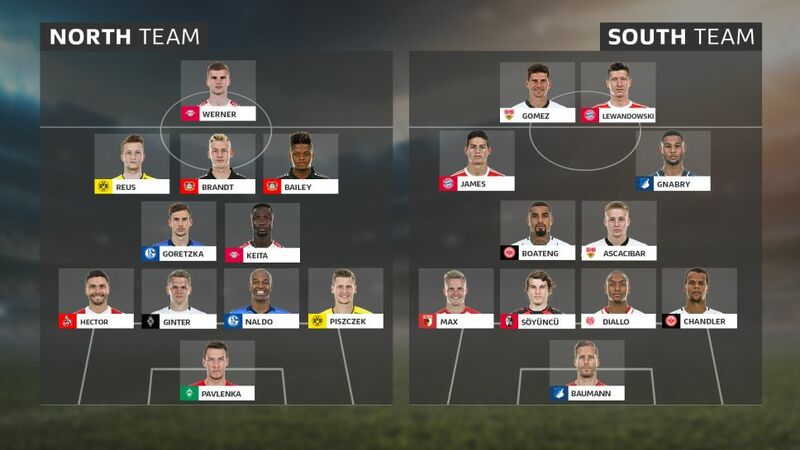 Bailey's telepathic understanding with Bayer team-mate Julian Brandt – the fleet-footed Confederations Cup winner who made his Bundesliga debut at 17 - could spell curtains for the boys from the South. To paraphrase Indy rockers the Kings of Leon, "this kid is on fire!" Bailey and Co. are class – world-class in fact – but is there a better attacking midfielder in world football today than a fully fit Marco Reus? Few players ghost past opposition defenders with such panache; even less combine effortless runs with end product. From Rolls Reus to Turbo Timo. Werner's pace and directness in the final third are a match made in heaven for the North's eye-popping midfield quintet. They might have to play rock, paper, scissors to decide who takes penalties, though…. Ok, he's not Manuel Neuer, but hear us out. Oliver Baumann has the experience of fighting relegation and playing in Europe; he's also a fine shot-stopper with top-notch distribution. Technically a Bayern player, but currently on loan at Hoffenheim, Serge Gnabry offers that injection of pace to the southern ensemble. He could even fill in at full-back or in attack, should the need arise. Completing the South's old-school front two combo, please be upstanding for Robert Lewandowski. Bayern's No.9 guarantees you at least 30 goals a season, and scarcely misses a game. At 32, Mario Gomez is still banging in the goals. The Stuttgart forward's not the nimblest or quickest out of the traps, but boy does he know how to finish.